The week in progress is locked even in premium subscription. I want to make corrective actions to my week as it happens, not when it has already ended and there is nothing I can do about it. Just unlock the week in progress already! This is my favorite app. I’ve been using it for a few years and I like seeing how my lifestyle has improved, such as steps and activities, and how I spend my time. Occasionally it won’t register when I leave my apt and walk a cross the street for dinner or something which is annoying. But for the most part it works as it should and provides valuable insight into my life. I used to give 5 stars. Now it’s 1 star. It’s been a whole year almost without support for complications in the new watch faces of Apple Watch Series 4. Enough with that. The app does a pretty good job overall and doesn’t use much battery. I do usually have to revise things a few times a week, but it’s not too much work. However, it hasn’t added any significant new features in the year I’ve had it. Especially since I had to pay for premium, I expected more app development and support than has been the case. I absolutely love this app and I’ve recommended it to many friends, but I wish there was a map showing all of the locations I’ve been to. That’s the only possible improvement I can think of. If you’re a human (or even if you’re not), download this app. You never know when you’ll need to go back and look at what all you did on a certain day and how long you spent on different things. Also helps with time management. I use it all the time. Talk about a useless waste of time! 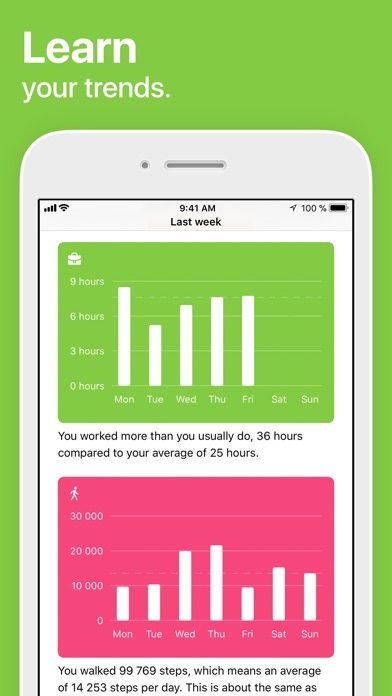 This is a great app to figure out exactly what you are doing with your life! And the aggregated summaries are very interesting and insightful. It might nice if you added screen time data into the app-the amount of time you looked at your screen. I really like this app- I find it interesting to see how much/little time I spend on things. It has been good for helping me find some balance in my life. I only wish it would sync to my Fitbit for steps- that would make it 5 stars. This is a great App. It has helped me change my habits. I enjoy reviewing not only my daily standings but comparing how I have improved week over week and month over month. Please bring back the weekly, monthly, yearly breakdowns for specific activities? They don’t seem accessible anymore. 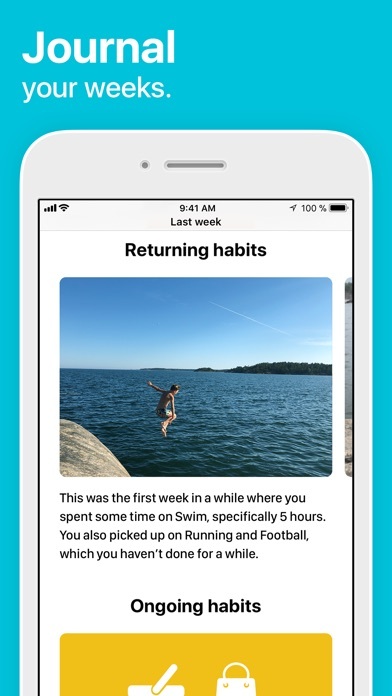 Another feature request: allow associating photos to specific events and/or allow edits to photos chosen for weekly journals. Thanks for keeping this up, one of my favorite apps! I used to love this app and it made me be more intentional with my time, but lately the time entries are very inaccurate which is really annoying. It will register where I am, but the timing of the activity will be completely off. For that, I'll most likely be deleting the app. It's too bad because I really do like the idea of it! As you start to identify where you have gone throughout the day (it prompts you to do so). Life Cycle gets smarter and smarter! It so cool to see what you have done throughout the day. As the data gets better and better you learn a ton about your habits! 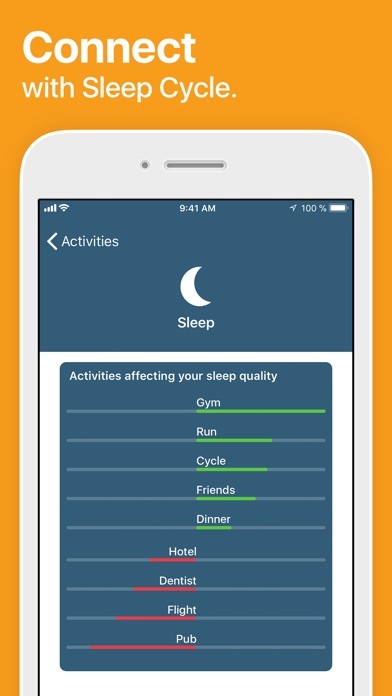 The sleep cycle app (free) paired with this tracks your quality of sleep! It’s freakishly accurate, I would highly recommend this and sleep cycle! You become more efficient and start getting better sleep which gives you more energy! Wish I could layer activities, such as “dinner” + “time with kids” or “friend’s house” + “sleep”. Otherwise, this is a great app. I really like this app it helps to answer the question, “just what did I do all day?” However my biggest issue at the moment is that, for what ever reason, when I arrive home the GPS hops all over my neighborhood. These occurrences happen often while I am in sleep cycle mode. I currently have 7 different locations that are marked as home. Six which are no where near my home. This is my only complaint. It is very unnerving to think my phone is out walking the neighborhood while I am sleeping. I love this app and would really like to see more from the developers. 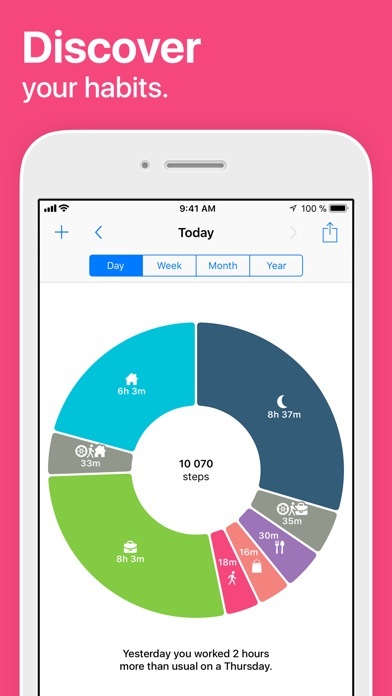 I’ve been looking for more health apps including eating cycles, mental health, physical health as well as mensural cycles. It would be great to see my symptoms on a circle similar to my daily activities! 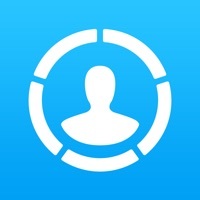 Love this app but really wish there was a feature that let you add people to activities. I’d like to look back in the month/week etc and see how much time I’m spending with specific people. I travel for work a lot and it’s incredibly useful to know when I arrived at and left a job site. I didn't use the app for a while, and now EVERY time I open it, it needs to process data from over 160 days. If I restart the app, it restarts the process over, if I let it finish for 15 to 20 minutes it freezes at the end and won’t function. It doesn't allow pausing the processing or allowing it to run in the background even while you review data that was already processed. I had to give up, it was completely broken for me. I love this app and It’s super useful to see how much I work vs sleep and hanging out at home. It’s great. However I really wish that the week/month/year cycles were continuous like the day cycle. It would be great to see how much I’ve done so far this week/month/year without having to wait. There was another program - that has been discontinued- that I used and wished I could add notes, or incorporate other data. Life Cycle does it for me. Highly recommended. 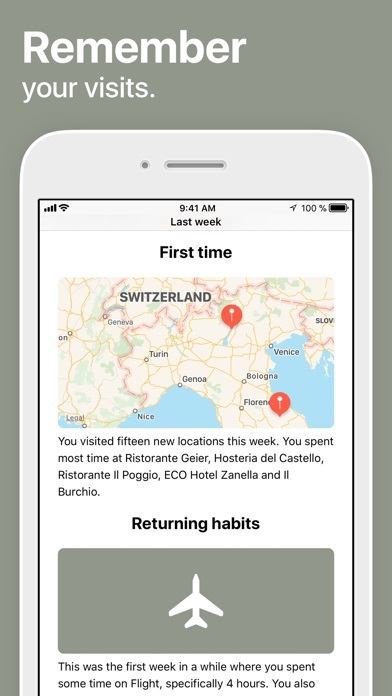 For the first month of using this app, things were overall fine until suddenly the app edits entries from weeks ago saying that I spent hours at weird locations (e.g. eating lunch, at work) during weird hours. I’ve had this app for weeks and it still has not been enough time for it to collect data. This app is amazing and accurate. I really enjoy this app. But I have one request. Add something in the settings that allows us to decide what our week is. For the app it is Sunday-Saturday. I would want Monday-Sunday. I enjoy this app a lot. I’m trying to improve work life balance and increase activity in general. This helps me see behaviors over time. I wish you could correct a location though because sometimes it pins incorrectly. Especially if a short errand. life cycle is amazing and it really helps when i forgot where i was on a certain day, but every time i’m at my house and i’m not on my phone, life cycle thinks i’m in a car, or “transportation”. this happens at least 5 times a week and it also happens on days when i don’t even leave my house. i could find a place where i could report that bug so i’m doing it here. don’t get me wrong this app is great, but this one bug is getting really annoying. Successful people are trackers and this allows me to gain a new perspective on how I spend my time. Awesome app with amazing value! I think it’s interesting to track daily habits and gain insight on my routines! this is a really cool app. i love looking back at all my activity!! It’s really helped me be conscious of how I spend my time and balance my life. Plus it’s just cool. It kind of neat seeing how I spend my time when I’m away from home. If I could separate my home time a bit, that would be cool. I like it but not enough to spend money on it.